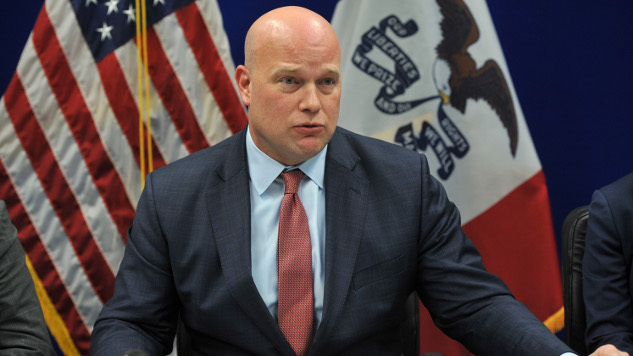 Given acting Attorney General Matt Whitaker’s already questionable track record on the Mueller investigation—among other issues—it was already an issue that President Trump had appointed someone who wasn’t in the line of succession to the most powerful seat in the Justice Department. Now, Senate Democrats are fighting back. Three leading Democratic Senators filed a suit Monday to block the nomination on the grounds that it is unconstitutional. They claim that the appointment violates the Appointments Clause of the Constitution, which requires that principal officers be appointed “with the Advice and Consent of the Senate.” Sens. Richard Blumenthal (D-CT), Sheldon Whitehouse (D-RI) and Mazie K. Hirono (D-HI) filed the suit, which marks the latest and most aggressive court challenge against the appointee to date. Last week, the state of Maryland challenged Trump’s appointment on the grounds that his failure to consult with the Senate is unconstitutional. The state also requested a declaration that U.S. Deputy Atty. Gen. Rod Rosenstein, who is the next in the Justice Department’s line of succession, should take the position. The state’s challenge came as part of its existing lawsuit against former Atty. Gen. Jeff Sessions, under whom the Trump administration worked to dismantle the Affordable Care Act—through which, despite the administration’s best efforts, nearly 9 million Americans enrolled for health insurance last year. The administration stopped defending key parts of the Affordable Care Act on the grounds that Congress repealing the tax penalty for individuals’ failure to buy health insurance made the law unconstitutional. Now that Sessions no longer holds the position, the state contends that the unlawful acting Attorney General has no authority to respond to the lawsuit. Trump, meanwhile, has taken the challenge to his unconfirmed and unqualified nominee about as well as expected. Yesterday, he took to Twitter, as usual, taking aim at Rep. Adam Schiff (D-CA), the incoming chair of the House Intelligence Committee. Trump referred to Schiff as “little Adam Schitt” in a profane, misleading tweet comparing Whitaker’s appointment to that of Robert Mueller leading the Special Counsel investigation into Russian interference in the Trump campaign. Mueller was appointed to Special Counsel by Deputy Attorney General Rosenstein, and unlike Whitaker, does not require Senate confirmation for the position. With the new lawsuit, there’s a chance that Democrats could fight back against President Trump’s latest attempt to rein in the Mueller investigation. Trump’s name-calling was likely spurred by an interview earlier that morning with Rep. Schiff on ABC News’ This Week, one in which Schiff promised House Democrats would investigate Whitaker’s appointment once Democrats took control of the House in January.